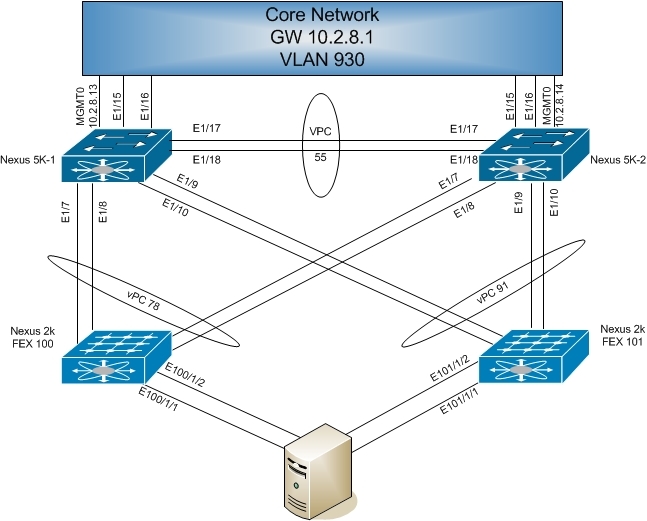 In this scenario, I have two Cisco Nexus 5548s, two Cisco Nexus 2248 FEXes, and a Windows Server with 4 Ethernet interfaces where two interfaces connect to FEX 100 and the other two connect to FEX 101. 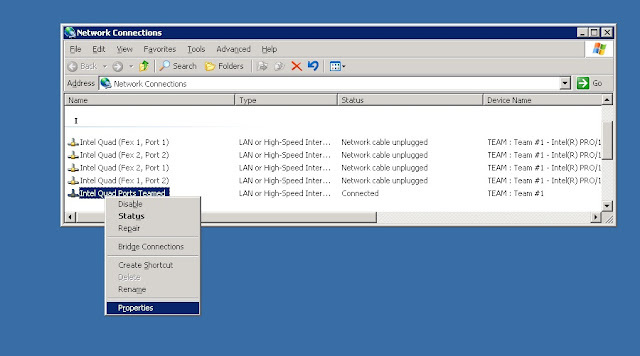 I want to configure Virtual Port Channels in such a way that if there is a loss of connectivity from either 5K, the two FEXes will still service clients. To start, I'll configure the management interface address (10.2.8.13 and .14), and default gateways for both 5Ks (N5K-1 is shown). 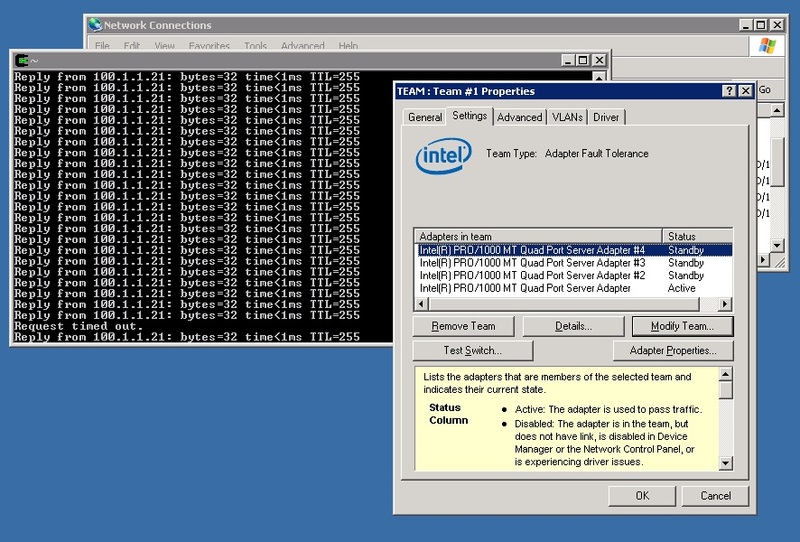 Note that the management interface is in the management VRF. I will use the management network as the keep-alive management link for the vPCs I'll create. Now I'll create uplink trunks to the core network for access to VLAN 930 for both N5Ks (N5K-1 is shown). Each N5K will have two links to each FEX which I will configure as port-channels. I'll enable the features for fex and lacp for both 5Ks (N5K-1 is shown). Now I'll stage connectivity to the two FEX units; 100, and 101 for each 5K. Since I will be creating port-channels afterward, the FEX associations will only require 1 link for pinning. (N5K-1 is shown). Now I'll create port-channels 78 and 91 (N5K-1 is shown). Now I'll associate the port-channel interfaces with their respective FEXes (N5K-1 is shown). From N5K-1 I see the two FEXes online (since I configured this one before N5K-2), but for N5K-2, I see them as "offline". This should change once I complete the vPC configuration. Since the FEXes are online for N5K-1, I should be able to see all interfaces available on both FEXes. Now I'll establish the vPC configuration. I'll create vPC domain 55, and use the management network for the peer-keepalives. I'll then create a port-channel between the N5Ks, and enable that for vPC peer-linking. Now I'll verify that the vPC is operational. On both N5Ks, I'll create port-channel 78 and 91, and create vPC 78 and 91. At this point, I'll enable the access ports for both FEXes to the server. (N5K-1 is shown). On the server, I have an Intel Quad port card which I've teamed together. I've assigned the address of 100.1.1.7/24. I'll test connectivity by pinging 10.1.1.21. This is a machine in the core network on VLAN 930. 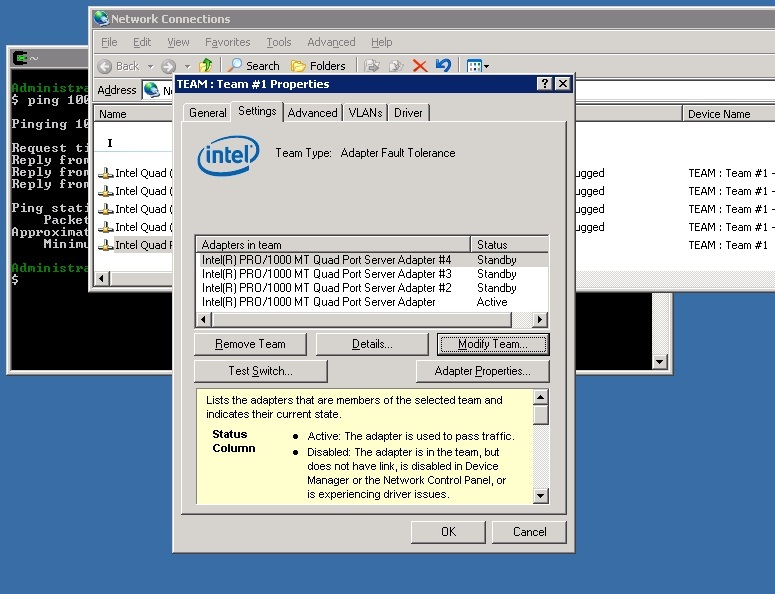 Note that although the ports are teamed, I've left the adapter in fault tolerance mode. This means that one port will be active, and the rest will remain in standby. I'll set a continuous ping, and then reload N5K-1. Note that a ping packet was lost, but the adapter remained the same. This means that FEX 100 was able to continue providing access to the server through the vPC through N5K-2.